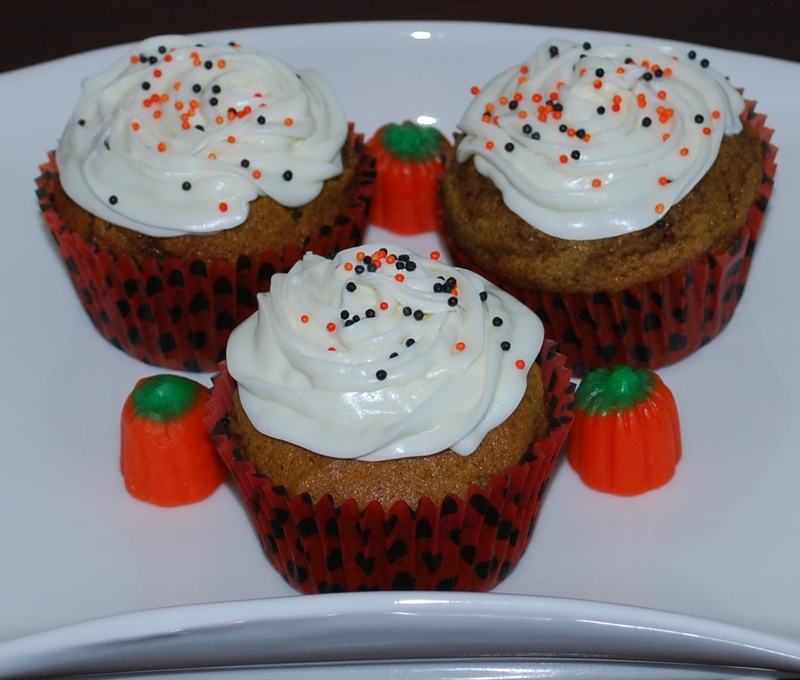 The smell and taste of pumpkin pie will come to mind when making these scrumptious cupcakes! Optionally fold in raisin and/or nuts before baking. You can also choose to use purchased cream cheese frosting. Makes about 34 as shown. If using a pie pumpkin, cut the pumpkin in half and remove all seeds and stringing pulp. Place flesh side down in a cake pan and add water so it only comes up a quarter of the way to the pumpkin. Cover with foil and bake in a preheated oven at 375 degrees for an hour or until flesh is soft when pierced. Be careful when removing foil, because hot steam will be released. When cool enough to handle, remove flesh and puree until smooth in a blender. Remove from blender and set aside. If using a Jarradale Pumpkin or Fairytale Pumpkin see How to Cut Pumpkins for Baking and Cooking in the Technique section. In a large bowl measure all dry ingredients and set aside. This will create a Mise en Place to make it easier and quicker to make the cupcakes. You will not have to stop and measure every ingredient. In a large mixing bowl cream sugar and butter with a mixer. Incorporate eggs one at a time. Add pumpkin and water and mix gently. Gradually add dry ingredients. Scoop batter into cupcake pan about 3/4 of the way up each cupcake holder or spray tin with Pam and add batter. Bake in a preheated oven at 375 degrees for about 15 – 20 minutes for regular sized muffins or when a butter knife is inserted it comes out clean. Make frosting while cupcakes are cooling. In a medium bowl beat the ingredients together until well blended. As soon as the cupcakes are cool, spread or pipe the frosting over the cupcakes. 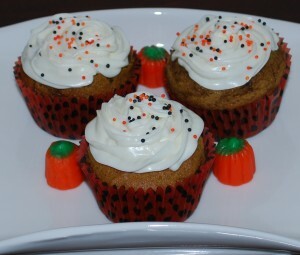 If you are making them for Halloween add sprinkles, candy corns or candy pumpkins.